Eyebrows are one of the most important keys to framing a face. In fact, perfectly shaped eyebrows can act as a mini-facelift. Here are some tips for creating beautiful brows. The most beautiful brows are natural and full. Women often over-pluck and then end up with thin brows that don’t grow. If your eyebrows are thin, try an eyebrow growth product, like Billion Dollar Brows Brow Boost or Latisse (FDA approved for eyelashes, but can be used on brows as well). Hold a ruler vertically on the outside of your nose. The inside of your brow should line up with the outermost part of your nose. Move the ruler toward your hairline, and find the point where the ruler is on its edge. Tweeze any hairs that fall outside of this zone. 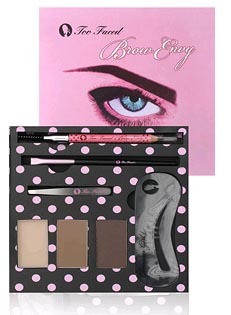 As for the thickness of your brows, only tweeze hair from the bottom of your brows. Sometimes, we don’t need the hairs tweezed, just trimmed. 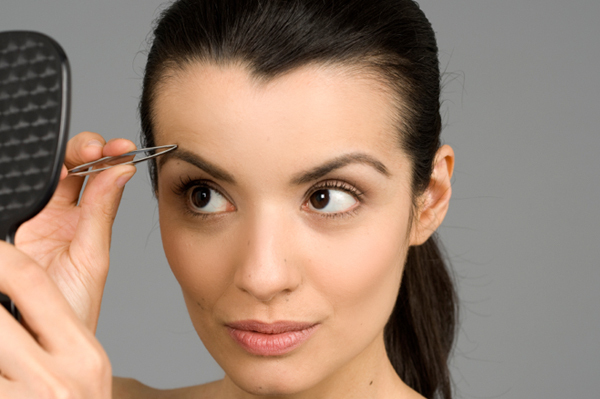 Brush your eyebrows up with an old mascara wand and trim the longer hairs with small scissors. Remember your brows when you color your hair. You don’t want your brows to be too much darker or lighter than your hair. Most salons will dye your eyebrows for you, or you can use a cream bleach at home — but only leave it on for one minute or less. Another benefit to slightly lighter brows are brighter, more prominent-looking eyes. The right eyebrow products can make a big difference. The best kits contain two to three shades of powder color and a wax. Use a small, slanted brush to apply the powder, and then set with the eyebrow wax. Pencils are great, too, and convenient. They need to be used with a light hand, however; otherwise, brows can look harsh and overdone.